Grzegorz Pojmanski, Warsaw University Astronomical Observatory сообщает: ASAS3V инструмент Автоматического Обзора Всего Неба (The All Sky Automated Survey) (телефото линзовый объектив 180/2.8, диаметром 65mm + CCD + Johnsons V фильтр, 3 минуты выдержки, размер пикселя: 14.8 arcsec,точность астрометрики - 4 arcsec) обнаружил возможную Новую в Щите: RA = 18h 38m 43s; DEC = -12d 16'.3. Не видно объектов с этими координатами на Паломарском обзоре (DSS images). Каталог USNO_B1 дает список очень красных и слабых объектов в области около положения возможной Новой. Поисковая карта для области возможной Новой Щита: http://shopplaza.nl/astro/vs-charts/v477sct.png Звезды сравнения (от 7.0 до 13.5m) с V ярче 10.0m были взяты из Tycho-2, и более слабые были взяты из ASAS-3. "NOVASCT2005#2 (?) 20051014.743 11.8m KWO (comps 112,121 ASAS-V)"
V477 SCUTI = NOVA SCUTI 2005 No. 2 G. Pojmanski, Warsaw University Astronomical Observatory,reports his discovery of an apparent nova on CCD images taken onOct. 11.026 (at V = 12.0) and 13.066 UT (V = 10.4) with a 180-mm-f.l. telephoto lens in the course of the All-Sky Automated Survey (cf. IAUC 8369, 8574), giving the position of the new object as R.A.= 18h38m43s, Decl. = -12o16'.3 (equinox 2000.0). Pojmanski notesthat no object is visible at this position on Digitized Sky Surveyimages, though the USNO-B1.0 catalogue lists several faint objects(red mag 19 or fainter) around this position; nothing was visibleat this position on an ASAS image taken on Oct. 7.055 (limiting magV = 14). H. Yamaoka, Kyushu University, reports the independentdiscovery of this apparent nova at mag 10.6 by K. Haseda (Aichi,Japan, 400-mm-f.l. f/4 telephoto lens + TMax 400 film) onphotographs taken on Oct. 13.419 and 13.420, the position for thenova given as R.A. = 18h38m44s, Decl. = -12o16'25". T. Puckett,Ellijay, GA, reports that the nova appeared at mag 10.2 on anunfiltered image taken on Oct. 15.99 UT with his 0.60-m reflector,and he provides the following precise position for the nova: R.A.= 18h38m42s.93, Decl. = -12o16'15".6. Visual magnitude estimates:Oct. 14.770, 11.0 (K. Hornoch, Lelekovice, Czech Republic); 14.846,11.7 (P. Schmeer, Bischmisheim, Germany); 15.813, 11.7 (Schmeer).N. 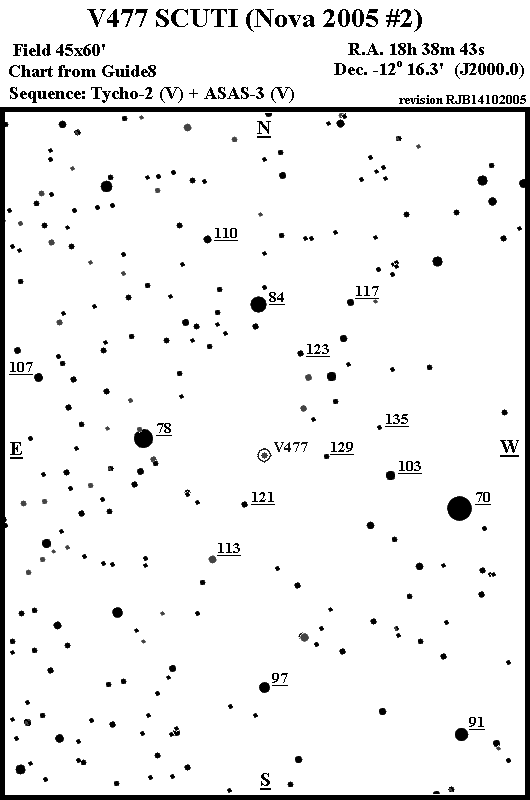 N. Samus, Institute of Astronomy, Russian Academy of Sciences,informs us that the designation V477 Sct has been given to this nova. R. K. Das, N. M. Ashok, and D. P. K. Banerjee, PhysicalResearch Laboratory (PRL), Navrangpura, report that their near-infrared JHK spectroscopy (range 1.08-2.35 microns) of V477 Sct,obtained with the Mt. Abu 1.2-m telescope (+ PRL Near-InfraredNICMOS3 Imaging Spectrometer), on Oct. 15.75 UT, are typical of aclassical nova and show prominent H I emission lines of the Paschenand Brackett series. Preliminary estimates for the Paschen-beta HI line indicate a FWZI of 6000 km/s or more. O I lines, generallyseen in classical-novae spectra, are also seen with the continuumfluorescence 1.3166-micron line being stronger than the Lyman-betaexcited fluorescence O I line at 1.1288 microns. Yamaoka also writes that a spectrogram of V477 Sct, obtainedby M. Fujii (Ibara, Okayama, Japan) on Oct. 16.43 UT, shows areddish continuum with broad emission lines including H_alpha (FWHM= 2900 km/s), H_beta, and O I 777.3-nm, suggesting that V477 Sct isa classical nova caught in the early decline phase. Nova Sct 2005 No.2: reddened nova M. Fujii (Fujii Bisei Observatory) reports the followingspectrum taken on Oct. 16.43 UT.http://www1.harenet.ne.jp/~aikow/etc/nova_sct_2005_no2_20051016.gif The Halpha and Hbeta are broad and strong in emission. (FWHM=2900km/sec for Halpha). Possibly suggesting a fast nova.Emission lines of [O I] (strong) and possibly Ca II, Mg II wererecorded. A typical spectrum of a fast nova slightly after themaximum.